Because we didn’t go camping this year we weren’t able to have one of our favorite summer treats, s’mores. As everyone knows, s’mores are as essential to the camping experience as camp fires and tents. It’s just not the same without them. I’ve been thinking about ways to bring the tasty treats inside and out of the woods. 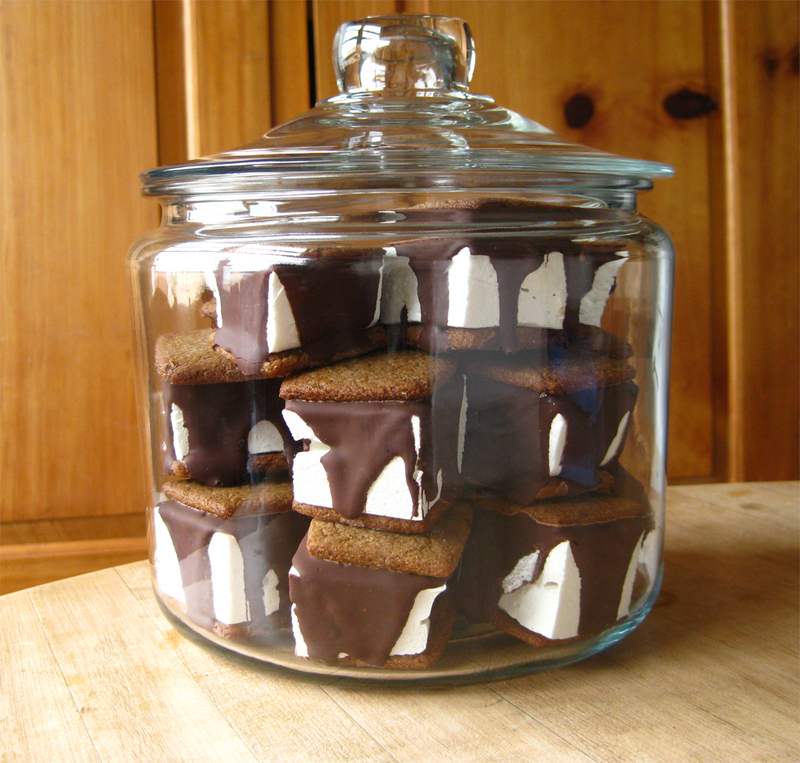 Why shouldn’t you be able to eat a s’more when ever you want, right out of the cookie jar? And why can’t the s’more become a cookie that’s meant to be enjoyed year round instead of just during the summer? Breaking down the concept of a s’more cookie is fairly simple when you’re talking about three easy ingredients: marshmallows, graham crackers and chocolate. But how many people do you know who make their own marshmallows and graham crackers? For a couple of years, I’ve been making incredibly soft marshmallows that are easy to whip up. With a little patience and chemistry these soft airy confections come out tasting like sugary clouds, putting to shame any commercially made bag of marshmallows from the grocery store. Even though they take time to make, once you’ve tasted these babies you’ll never want to pick up a store-bought bag again. I found this recipe in a Martha Stewart Christmas Magazine but it’s also on her site. As for the grahams, I’ve been eyeing Kim Boyce’s graham recipe from her book Good to the Grain, a collection of recipes using whole-grain flour and a new favorite in our reference library. I picked up the book last spring. We’ve tried a few of Kim’s recipes with great success and the only thing holding me back from making her graham crackers was a shortage of retail sellers of Teff flour. I couldn’t even find it at the local super crunchy co-ops. A trip to Whole Foods was all it took. Teff flour has a malty taste to it that compliments the earthy graham flour. The finished crackers taste exactly like the graham crackers I grew up on, only a little better. While I might be a few months behind the rest of the country where people enjoy s’mores throughout the summer, including national S’more’s day on August 10, in my defense we San Franciscans are just getting our predictably few warm “summer” days. And even with the unusually warm weather this week we were a little too busy in the city with Halloween, the Giants winning the World Series and a parade that brought a million people to the streets celebrating San Francisco’s first series win. Congratulations Giants! So now we have to play catch-up with the rest of you. Let’s hope the warm weather keeps for another weekend or two. We think once you try these s’mores you’ll want to enjoy them at home year round. Summer camp in a jar. Coat a half sheet cake pan with cooking spray; line bottom with parchment paper. Coat the parchment with cooking spray, and set pan aside. Put sugar, corn syrup, and 3/4 cup water in a small saucepan. Cook over medium heat, stirring, until sugar is dissolved. Stop stirring; let mixture come to a boil. Raise heat to medium-high; cook until mixture registers 260 degrees on a candy thermometer. Meanwhile, sprinkle gelatin over 3/4 cup water in a heatproof bowl; let stand 5 minutes to soften. Set the bowl with the gelatin mixture over a pan of simmering water; whisk constantly until gelatin is dissolved. Remove from heat, and stir in vanilla; set aside. Pour mixture into lined pan. Using an off set spatula sprayed with cooking spray, spread out the marshmallow fluff into every corner. Moving the spatula in one direction at a time and not swirling it helps keep it uniformed. Spray another piece of parchment paper with cooking spray and place over the top. Allow at least three hour, or preferably overnight, to set up. Remove from pan; score marshmallow by 1 ½ inch squared and cut. In a medium bowl whisk together the wet ingredients. Add the wet ingredient to the dry ingredients and mix until formed, using your hands is a good trick. Form the dough into a square and wrap in plastic and chill for at least one hour or overnight. Preheat oven to 350 degrees and line two cookies sheets with parchment or silpat. Lightly dusting your work surface with flour, roll the graham dough into a square shape, rotating the dough as you roll to assure the dough does not stick. Roll the dough out to about 1/8 inch thick. Using a ruler or a yardstick, cut into 1 ½ x 1 ½ inch squares. Transfer the cookies to the prepared baking sheets. Bake the cookies for 15 to 17 minutes, rotating the pans after the first 8 minutes. The edges will be a little browner than the rest of the cookies but be careful not to burn the cookies or under bake them. The dark brown of the cookie dough can be a little tricky to judge at first. Allow to cool on baking racks until the marshmallows are cut and the chocolate is melted. Place a rack on each of a two baking sheets and put 24 cookies on each rack. Place a marshmallow on top of each cookie. Drizzle the melted chocolate over each marshmallow cookie allowing some parts of the marshmallow to remain bare. Allow the chocolate to set up for five minutes and then place the rest of the grahams on top of each marshmallow. The grahams may not all be perfect, and neither will the marshmallows, so selecting the right cookie with the right marshmallow will make the cookies look their best. Allow the chocolate to set up before placing in a cookie jar. Hi! I just came across your blog, and I’m loving it! Can I ask you about your marshmallows? I’m hoping to make some for Christmas gifts, and am wondering how long they keep? Especially considering the egg whites…? The marshmallows will keep for a good week, or longer, if they are kept in a plastic bag. Just dust them with a little powder sugar first. The egg whites actually cook with the hot sugar so there is no need to be concerned with food poisoning. If you really want them to stay fresh longer you can dip them in chocolate. Just make sure to temper the chocolate or you may get white spots on them. They’ll still taste good, but they won’t look as pretty. I hope this help. I’m getting ready to make up a batch today. It’s been way too long and my sweet tooth needs some sugar. Thanks again, Happy Holidays to you too.